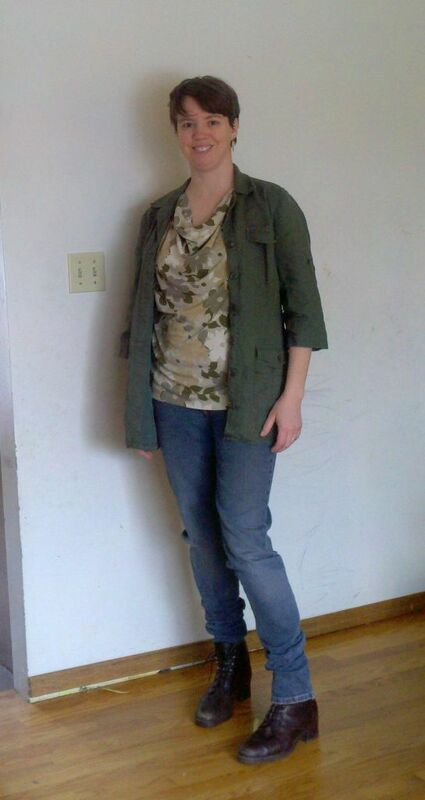 I'm not sure what to call the colors of this top - it's a floral, in light sandy camouflage colors. I have a hard time figuring out how to wear it, but I love the shape (not sure what the neckline is called - a sort of a cowl drape?). 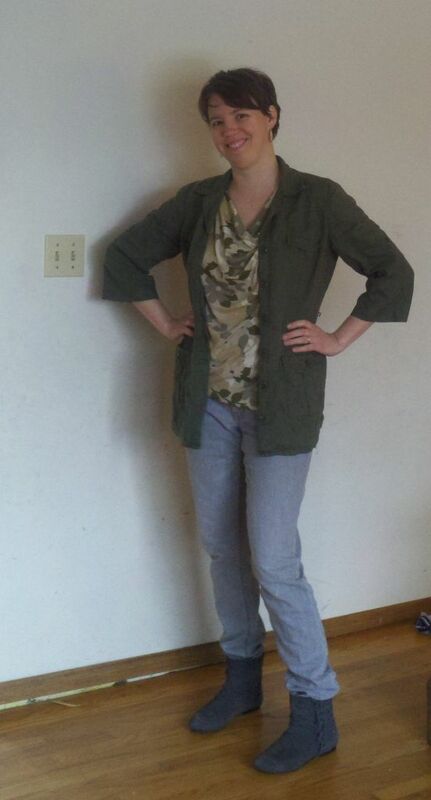 So here it is with an olive utility jacket, jeans and rate short-ish boots. I originally styled this with gray jeans and bray booties, but the grays had too blue undertones, and didn't work with the yellow undertones of the top and jacket. I think this works a bit better (because the boots are a yellow undertoned brown, I guess). I liked the more saturated look of the slightly darker jeans too. Ooh love this. It almost looks like camo print! I like it as you styled it in 1. I can see where you were going with 2 though. And yes - it does look a lot like a camo print, especially from a distance. I think #1 worked a lot better - I didn't realize how blue my bottom half was in #2. It looks terrific. I love the muted colors of the top on you. It looks great with the army green! The top works really well with the jacket. I do love it with the boots in 1, but the blue booties in 2 also work to me, they give you one long line on bottom.